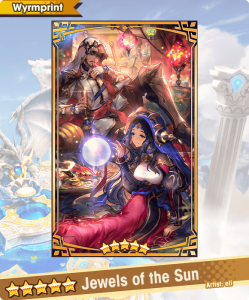 Summon Showcase The Desert Jewel and the Abyssal Flame, available now! The Summon Showcase for The Desert Jewel and the Abyssal Flame opens Oct 30 23:00(PT)! Featured adventurers, dragons, and wyrmprints will have an increased appearance rate. 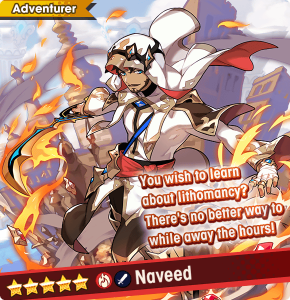 Some of the featured adventurers, dragons, and wyrmprints are detailed below. A youth on a journey from a foreign land. He's an apt student of swords and lithomancy—a magic that uses the mana contained in gems. His modest and easy-going nature makes him popular, but he's oddly awkward with women. Deals flame damage to enemies directly ahead, and shoots flame blades relative to the number of times "Radiant Bauble" has been used. This skill can be enhanced up to five times. Increases the user's defense by 15% for 10 seconds,and enhances the skill "Crystalline Blades" for the remainder of the quest. The skill can be enhanced up to five times. Increases dragon gauge fill rate by 15%. Increases strength by 6% for every five enemies defeated (up to five times per quest). Reduces susceptibility to sleep by 100%. Fills 100% of skill gauges at the start of quests. ・ These are the stats for maximum level with all mana circles unlocked. They do not represent the stats when first obtained. The fire-wielding gatekeeper of the underworld. A free spirit, she often shirks her work in favor of play. The sentient, puppet-like dogs on her handsare called Coco and Mimi, and their intelligence allows them to speak and attack on their own. Deals flame damage to the target and nearby enemies, and inflicts burn and reduces their strength and defense by 5% without fail. ・ These are the stats for maximum level, fully unbound, and maximum bond. They do not represent the stats when first obtained. Increases skill gauge fill rate by 6%. *These represent stats when fully unlocked. Increases the potency of recovery skills by 13% when HP is 70% or above. Increases defense by 40% for 15 seconds when HP drops to 30% (once per quest). 2. To check Summon Showcase appearance rates, tap Summon on the in-game footer menu, then select Appearance Rates. 3. 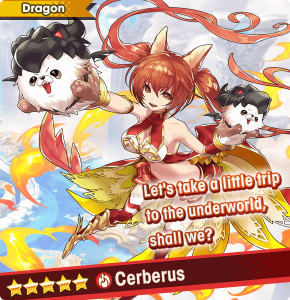 For information about other featured adventurers, dragons, and wyrmprints, tap Summon on the in-game footer menu, then select Showcase Info. 4. If a summon results in a character you already have, you will receive Eldwater instead of the character. The amount of Eldwater you receive will vary depending on the character's ★ number. 5. Only diamantium (purchase required) can be used for Daily Deals. Daily Deals reset every day at 23:00(PT). 6. The active period and content of Summon Showcases may change without warning. 7. 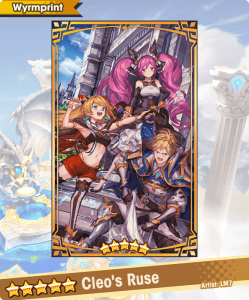 If you summon 10 times in a row and do not summon a 5★ character, dragon, or wyrmprint, the appearance rate for 5★ characters, dragons, and wyrmprints will increase the next time you summon. 8. For more information, tap Summon on the in-game footer menu, then select Warnings.